Lo and behold! Welcome our holy grail – glucose! While glucose’s essence as the holy grail may be debatable, glucose undeniably serves as an essential energy source for our bodies. In order to utilize glucose as our energy, we must first digest food that contains glucose. There are two main types of digestion: intracellular and extracellular. Let’s first dissect the ‘anatomy’ of our word “intracellular.” The prefix intra means “on the inside” or “within,” and the suffix cellular literally refers to our cells. Intracellular digestion thus means digestion that occurs inside our cells. As for the word “extracellular,” with the prefix extra meaning “on the outside,” we can thus infer that extracellular digestion means digestion that occurs outside our cells. While it may not seem intuitive, areas such as the opening of our mouth or the alimentary canal of our intestines are referred to as the “outside” of our body. Anything that is not inside the cell or anything outside the cell borders is known as the outside. Let’s apply this. Our sandwich entered the stomach and is simply churning around inside, bumping against the stomach’s rugae. Pepsin is breaking down the peptide bonds of proteins, but no nutrients have been absorbed by any cells yet. Which type of digestion is this? Extracellular! To elaborate more, extracellular digestion in our human digestive system occurs in the alimentary canal. The alimentary canal runs from the starting point of digestion, our mouths, to the end of the digestive system, our anuses. Releasing enzymes, such as pepsinogen and pepsin, to the outside of our cells also means extracellular digestion. For digestion to be considered intracellular, the nutrients – glucose, fatty acids, proteins, etc – must be inside our cells, not the lumen or opening of our digestive system. The alimentary canal of our intestines was also observed in this fascinating ancient Chinese scripture for medicine. For example, if the chyme (partially digested food ball) was being emulsified by bile from our liver in the small intestine, this emulsification is occurring in the inside of the lumen. This is extracellular digestion. However, if the lipid molecules were being taken up by the lacteals inside the villi and later transported into a small intestine’s cell for oxidation, then yes, this is considered intracellular digestion. The act of oxidation of fatty acids inside the cytoplasm of a cell is where intracellular digestion starts. And, just for kicks, single-celled organisms such as paramecium and amoeba undergo intracellular digestion to get their nutrients. This relates back to the intracellular digestion in us humans because in order for intracellular digestion to occur, it must be performed physically inside the individual cell. Do humans do intracellular digestion or extracellular digestion? We do both! 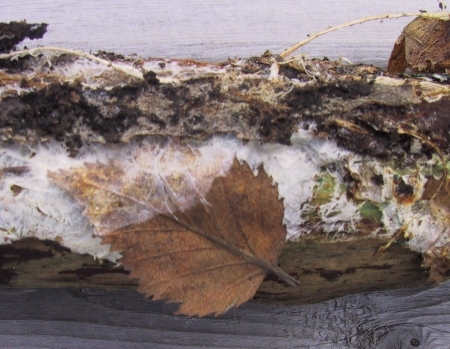 White hyphae of fungi digesting a browning leaf: Yum for nutrients! The Digestive System by Alexander Stone Macnow, MD. MCAT Kaplan Biology Review. *Answer: Extracellular! This fungi (the white hyphae) produces extracellular enzymes to digest the leaf, which is outside of its body and outside of its cells. Succinct and quick informational read, thanks! Thanks Nelson! Glad this helped! Wow….I’m impressed with the format of your page! It’s so professionally formatted. I have a long, long way to go, I can see. I just opened a WordPress page a couple of days ago. Unfortunately, I’m a complete beginner to this whole concept; i.e., format, etc.How can I best learn to set up a decent looking page? I guess I;m looking for shortcuts, and there probably aren’t any! (Haaa! – there never are, right?) I just don’t know what I’m doing, generally. It doesn’t seem very intuitive to me. I keep having to post something, then fix something, then re-post…continuously! But, I have quite a few essays, like the ones I posted, that I really didn’t know what to do with – so, I put them up. I’m very surprised to get a response so soon! Thank you!!! I’ll be putting up more very soon (I’ve got a little over 200)! Thanks so much, Dale! That means a lot to us, and we’re glad to help you. Your articles are very nice and informational on your site as well – 200, wow! We would recommend dicing up the sections with some pictures, to be visually easy on the eye, and take advantage of the HTML headings – they will be your best friends. 🙂 If you would like, our team on our Facebook page could explain more with tips and details – feel free to leave us a message there! Thanks for visiting our global education site! Wow… I feel so much smarter for reading this! You’re really great at teaching this. I was never really good with Biology in school but you’ve made me like and appreciate it a little more! Thanks for the share! Thank you so much, elenaverse! We’re so ecstatic to hear that – we’re crying happy tears! 😛 We strive to make learning fun and engaging, and it looks like it’s working. Thanks again, fellow fairy. By the way, we love your fantasty stories. Keep up the fantastic work! Aw… I am so touched and humbled by your comments! I took a huge risk that is so uncharacteristic of me by publishing these stories to the world! I have been trapped in the elenaverse for too long. A writer’s greatest joy is knowing her readers enjoy her work and it is my greatest honor to read that I have entertained me. As for your wonderful site, oh how I wish you guys were my biology teachers. I’d totally be a doctor by now… Keep edu-taining us as always. Love, Elaine. Thanks so much, Elaine!! Write on! 🙂 Looking forward to more of your exciting fantasty work! Thank you, thank you! It’s very fun to do… Keep doing your great work too! Thanks for stopping by! This is a really cool article… it addresses so many age groups, and is written in a very interesting flow and format. Congratulations! Kudos on the job well done. I’m a fan…and follower! Have a great day! That’d be fantastic! Thank you for your support! Thank you for visiting! We hope our educational lessons helped. Hi, this weekend is pleasant in support of me, for the reason that this moment i am reading this fantastic educational piece of writing here at my residence. Great job ..it is now very easy to learn by virtue of this website. Short and concise words. Really helpful and informative!! Thanks!